This is a little bit different from the types of books I normally review, I'm going to structure my review a little differently and skip my formal list of reasons why you should read this book and tell you a little bit about my experience reading it. 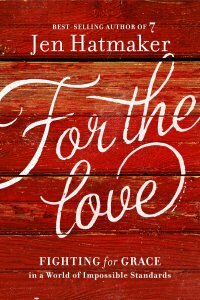 The first thing you need to know about Jen Hatmaker is that she's hilarious, and it comes across so well in her writing. I giggled my way through many chapters in this book! The second thing you need to know is that Jen is a Christian and loves Jesus. So yes, this could be classified as a Christian book but it doesn't feel like many that I've read. It is so much more than that! And she explores this idea in For the Love by talking about everyday things we encounter in life, with her own heavily sarcastic perspective on them. Whether she's talking about fashion, marriage, children, or just sharing some of her favourite recipes - it's all something we can relate to. Most importantly, I love that For the Love is not a book that simply talks at you. Jen wants to see people change, she wants to see the world change for the better. I mean, what good is a book like this if it doesn't impact my life? The love for God and the love for others is stamped all throughout this book - if that's not addressing real Grace, then I don't know what is. A friend JUST recommended this book to me yesterday. Thank you for blogging about it as well. I definitely need to check it out! Hi - I am new to your blog - came over from Lisa Boyle's Frugal Friday link-up. This sounds like a book I would really like - have already looked it up on Amazon! Thanks!